Tanya Augsburg is a humanities-trained, interdisciplinary feminist performance scholar, art writer, and curator who can be occasionally persuaded to perform. She teaches at San Francisco State University, where she is Professor in the School of Humanities and Liberal Studies in the areas of the Creative Arts and Humanities. Dr. Augsburg is author of Becoming Interdisciplinary: An Introduction to Interdisciplinary Studies, 3rd Ed. (Kendall/Hunt, 2016) and co-editor of The Politics of Interdisciplinary Studies (McFarland, 2009). Other publications have appeared in TDR: The Drama Review; Text and Performance Quarterly; Issues in Interdisciplinary Studies; n.paradoxa: International Feminist Art Journal; World Futures; The Colorado Critical Review; and Critical Matrix: The Princeton Journal of Women, Gender, and Culture. She was the juror and a co-curator of Man as Object: Reversing the Gaze, a large travelling feminist art exhibition sponsored by the Women’s Caucus of Art that showed at SOMARTs in San Francisco and the Kinsey Institute Gallery at Indiana University. She was also editor of the accompanying catalogue. She was Curator of Featured Artists and member of the Executive Exhibition Committee of Northern California Women's Caucus for Art (NCWCA)'s 2016 national exhibition, F*ck U! 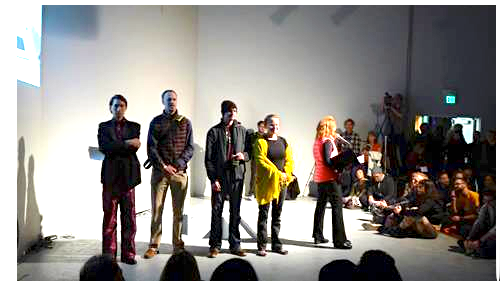 In the Most Loving Way, which was held at Arc Gallery in San Francisco. Her most recent research examines interdisciplinary and transdisciplinary theory, pedagogy, and assessment. Her survey book chapter on the interdisciplinary arts, "Interdisciplinary Arts," was published in the Oxford Handbook of Interdisciplinarity, 2nd Edition (2017). Her current projects include completing a book-length manuscript on the interdisciplinary arts and a book-length manuscript on feminist art and performance. Her favorite pastime is helping students succeed. Some of Dr. Augsburg's publications can be found on her profile at Academia.edu and Researchgate.net. For further information, please contact Tanya Augsburg at tanya@sfsu.edu.